Ah, the perils of a presidential campaign. Even while you're fending off serious deficiencies with one arm, you're patching up a few silly, embarrassing gaffes with the other. Such is the situation for the second-place Republican candidate. Ben Carson's campaign released a bogus U.S. map which made a flat-out mockery of the geography of New England. Even though they pulled it down Wednesday and replaced it with a corrected version, more than a few people noticed. The context of the image is dismal enough on its own. It's a map of the states splashed in red, gray, and blue, with the red states being the ones whose governors are publicly refusing to accept Syrian refugees (although this is not a matter they have any legal authority over). 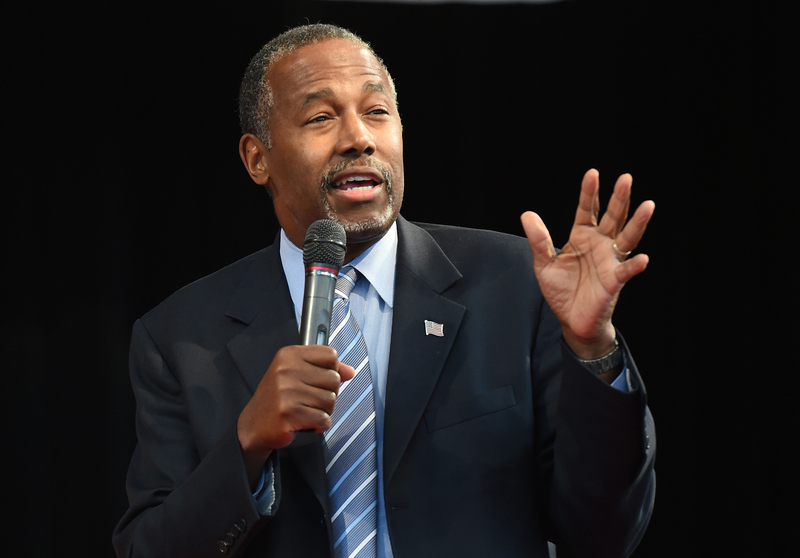 Carson, on the heels of a disastrously bad interview which exposed his lack of foreign policy knowledge, has been one of the Republican candidates stoking fears about ISIS militants infiltrating the United States via the refugee population, a sad trend since the terrorist attacks in Paris last week. Carson has even got a petition on his official website calling on Congress to block the 10,000 or so Syrian refugees America has pledged to accept over the next 12 months. And then there's this laughably inaccurate map of the U.S. It's hard to know exactly how this happened, but there you have it. The Northeast is mangled, with Rhode Island, New Hampshire, and Maine stacked atop one another in a butchery of state lines. Living in Vermont or Connecticut? Sorry, but your're not even pictured on Carson's map. Although in fairness, it's hard to tell exactly which state is meant to be which. The blue state underneath the misplaced Rhode Island is presumably Massachusetts, although it's terribly misshapen. Here's a before-and-after comparison — the image on the left, needless to say, is a little bit off. It's not a great look for Carson. His grasp of nuanced, fraught international affairs is being broadly questioned — even by some within his own campaign. So proving that he's got geography down pat would be a pretty good way to improve. At least he got a little karmic retribution, though. If you're trying to turn desperate refugees into a political cudgel, at least don't make a few embarrassing mistakes along the way.